K-leather for soft, smooth first-touches. Mid-foot compression for secure and responsive feel. May lack durability as compared to the copa mundials. Mid-foot compression may be uncomfortable for those who like a more free feel. When a cleat fits snug, it's the best feeling. The fact that mid-foot compression may be too much for some doesn't mean it's not for you. Remember, it's the responsive feel that is the benefit of having a nice tight ( but still comfortable!) fit. This will enhance your reaction time and prevent rollover. 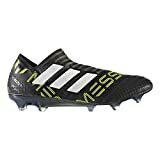 In the cleat manufacturing industry, we can say that Adidas has been in the forefront in making some of the best soccer boots used by professional soccer players. Some of their best productions are the Copa Mundial, the adiPURE series and also the Gloro. Well, this did not stop them from being creative since now we have one of their new inventions referred to as The Copa 17 series. This soccer cleat features some of the most unique and best characteristics that will enhance your game. Some of the great features that we have noticed on this pair of soccer boots include the K-premium upper, the compression tongue, the ortholite insole and we cannot ignore the lightweight sprint frame outer-sole. Also, note that the soccer boots are ideal for use in both turf and grass fields. For more information regarding the price, you can check out the new Copa 17.1 FG lineup at soccer.com. The Copa 17.1 is crafted with the modern, sleek features suitable for making your soccer games to be easy, but if we compare with the Copa Mundial cleats, there is a noticeable difference. This is because after comparing with two of the creations by Adidas, there is a clear indication that the Copa 17.1 cleats looks more like an adiPURE than the Copa Mundial. From the way they fit, the look and also the designs, the cleats are just like the adiPURE cleats. When it comes to choosing the right soccer boots, one is supposed to focus on the comfort that the shoes offer primarily. And well, to be honest, Adidas has not disappointed in crafting the Copa 17.1 cleats. The boots consist of the upper K-leather material that guarantees you comfort and support throughout your matches. The stitching of the boots is another reason to recommend since it is well done in such that the shoe will not stretch quickly after a few games. So we can say that the soccer cleats are designed to serve you for a long time. Furthermore, the shoes are designed to mimic your feet structure since it is easy to slip in plus it smoothly and efficiently covers your entire feet ready for the game. The ability of the shoe to form into the shape of your feet provides a firm grip as well. The soles of the feet are well protected as the inner bottom is crafted with an extra padded material. The inner sole has spongy material that is lightweight to prevent restriction when moving and also to protect your feet soles when running around the field. Unlike other brands that are crafted with laces that run up to the ankle section, Adidas have added a little bit of twist to their shoe designing whereby they use long compression tongue that runs from the upper part to the midsection of the upper foot. The tongue is crafted using stretchy material that is essential for providing a firm grip and supports the feet from the midfoot section. Therefore the tongue is equipped to provide a firm grip on your feet, and it also adjusts depending on the size and shape of your feet. Although the soccer boots consist of K-leather material, the fitting is quite smooth. The leather usually stretches a little bit to fit your feet shape and size. *Note – wearing the shoe for the first time maybe a bit uncomfortable but after a few wears, the boot takes the form of your feet hence making it comfortable to play with. Also, the fact that the middle foot consists of a full-design this provides excellent support for your feet to remain grounded throughout. Are the soccer cleats durable? To be honest, the shoes are made with the modern designs, but when it comes to durability, the cleats cannot compare to Mundials. 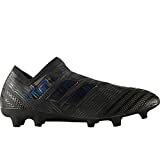 They are light in weight and have corner cuts that make the shoe have less life spun as compared to Copa Mundials that does not have any corner cuts. The fact remains that this pair of boots gives players a balance, comfort and excellent performance due to the lightweight build it has. Some reviews believe that Copa 17.1 FG is more durable as compared to Gloro. The Copa 17.1 soccer boot is designed to provide comfort and reliability for all players, but one feature that may be not reliable to some players is the presence of the compression tongue. As we saw earlier, this part of the shoe is equipped to provide a good fit and support around the mid-area of the feet. Some players may find this uncomfortable especially if they don’t like too much pressure around the feet’s arc. Also, the fact that the shoe adjusts to your feet after wearing it for a while may be a bit uncomfortable to wear for the first few times. Overall, this is a must have a cleat for anyone who wants to excel, but keep it natural. Comfort is very crucial when it comes to the football world, and Adidas have designed the Copa 17.1 boots to ensure that all the players are comfortable and can smoothly run around the field without straining. The shoe is made of k-leather that assures you long lasting effect and reliability as well. The shoe only weighs about 7.4 oz which is a high and comfortable weight for all players including the beginners. If you are hesitant regarding whether to get the boots or not, I would advise you to get a pair asap since your football games will be fun and memorable playing with this cleats.If you are wondering who is the best fit to use the shoe the answer is everyone! Whether you are a striker or a middle field player, the shoe is just perfect for you. The materials, the weight, and the comfort enables you to have natural movements on the field.